Omaha’s hosted big Hollywood premieres over time. The biggest came in 1938 for MGM’s Boys Town, when massive crowds turned out for stars and studio brass, followed closely by Union Pacific’s 1939 Golden Spike Days bash. 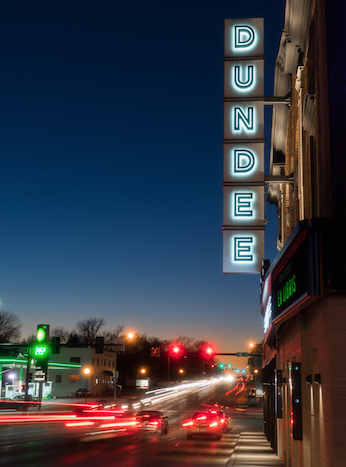 The dedication for the newly updated and reopened Dundee Theater, which began as a vaudeville showplace, has provided a major cause for celebration among film buffs, preservationists and neighborhood residents. 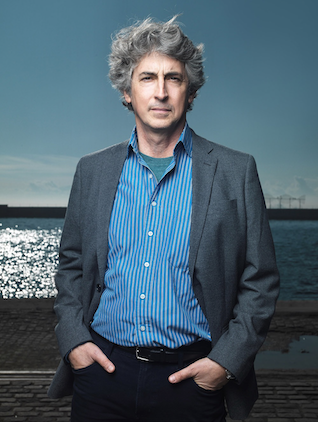 Hollywood royalty even comes with the package courtesy Omaha’s reigning film industry king, Alexander Payne, who grew up in Dundee and patronized the theater countless times. The writer-director is fresh back from a long production-editing slog, followed by a Greek idyll that saw him become a first-time father, to christen the return of his childhood, hometown movie sanctuary. His ballyhooed new film Downsizing opens there Dec. 22. This is Payne’s long-awaited, issues-laden, epic sci-fi satire about miniaturization as the answer to depleted natural resources in an over-populated world. Downsizing owns positive industry, festival and test audience responses and trends prime awards contender and money-maker. Depending on how it lands with Academy Award voters, it could be the first Payne film named Best Picture and it could win him his first Best Director Oscar. Paramount Pictures expects a box-office hit. With some $100 million invested in it, the studio banks on a triple-plus return worldwide, thus putting Payne in a whole new movie earnings bracket. Matt Damon, Kristen Wiig, Christoph Waltz, Jason Sudeikis, Neal Patrick Harris, James Van Der Beek and Niecy Nash are the big-name cast members but Hong Chau is the breakout star. In addition to Oscar-winner Waltz, the international players include Rolf Lassgård and Udo Kier. At least six Payne stock players appear: Laura Dern, Phil Reeves, Mary Kay Place, Margo Martindale, Tim Driscoll and Kevin Kunkel. As if scripted, this film by a Dundee devotee ushers in a new era at a theater that was among the local celluloid dream spots where Payne lost it at the movies. Since his family home is within a couple blocks, it became his home theater. Having his first feature, Citizen Ruth, play there in 1996 only strengthened the bond. Now that it’s part of Film Streams, on whose board he serves, he can truly call the Dundee his own. Susie Buffett’s purchase of the vintage 1925 theater on behalf of Film Streams saved an historic building from a discarded, disposable artifact fate after the previous owners’ planned improvements never materialized and it sat idle four years. It was saved the ignominious end of the razed Cinerama Indian Hills. 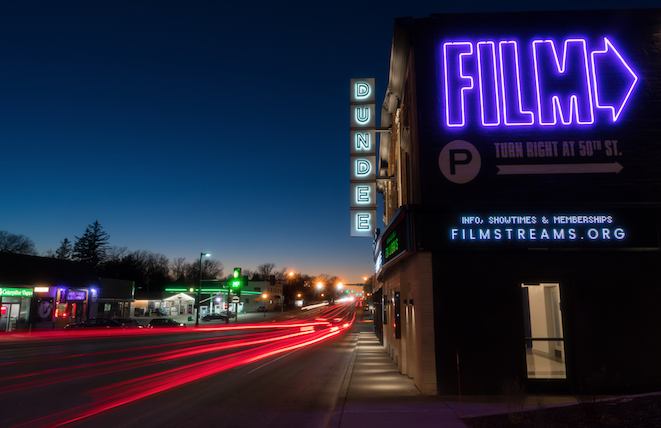 The Dundee’s rebranding under Film Streams enhances area cinema culture in a way not seen since the nonprofit’s north downtown Ruth Sokolof Theater opened in 2007. Owning nine decades of cinema history, the Dundee represents a physical and symbolic link to the medium’s rich heritage. Then there’s its own history for record-breaking runs and surviving as the metro’s last independently-owned and operated single-screen neighborhood theater. 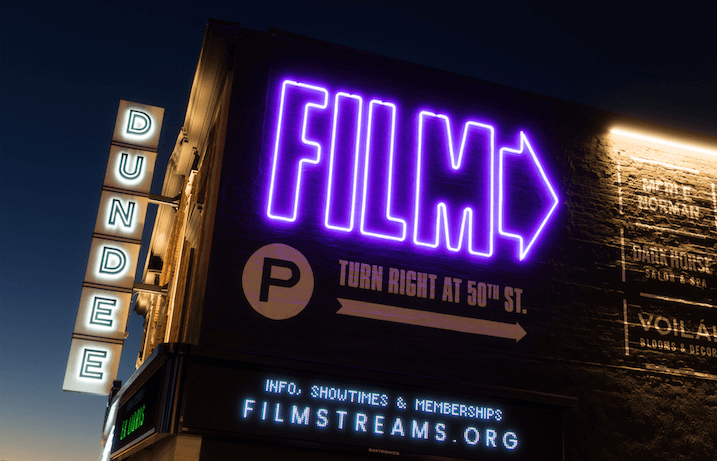 The millions recently poured into renovating it added a micro auditorium, thus giving it two screens for the first time and doubling the number of screens Film Streams can program. Like many locals, Payne’s seen the theater transition a few times. For most of his childhood in the 1960s, it was a mainstream exhibition site owned by the Cooper Foundation that screened first-run blockbuster roadshow attractions. “I spent a considerable amount of time in all of Omaha¹s movie theaters when I was growing up, from the old palaces downtown (Omaha, State, Cooper and Orpheum) to the Admiral, Indian Hills, Fox, Six West and Cinema Center. But the one I probably spent the most time in was the Dundee,” Payne said, “since I could walk to it, as soon as I could walk. I can¹t even say I was ‘proud’ of it – it was just always there. “I saw The Sound of Music there six times when I was 4 years old. It played there for many months (two-plus years), and you know how little kids like to see the same thing over and over again. My older brothers used to take me to the Saturday morning show for kids – usually monster movies, and they had giveaways. Before and after that slate of commercial fare, the Dundee showed art films. Then, in the hands of owners Edward Cohen and David Frank, the Dundee settled into being more of a second-run house. “In the early ’70s, they showed revivals of W.C. Fields, Chaplin and Laurel and Hardy – those early comedies had something of a renaissance then,” recalled Payne, whose own comedies revel in character-based physical bits and predicaments. When the filmmaker was in college in the 1980s, the theater came under new ownership again, this time in the care of Denny Moran, who returned it to its art house past and added midnight movies. Moran was still an Omaha law enforcement officer when he bought the theater. His wife Janet joined him in the business. In 2013, they closed it for renovations that outgrew them. They then sold it to Buffett for Film Streams to operate. By then, the Dundee was more grind-house than art house. in between those revivals, things came full circle for Payne when his Citizen Ruth illuminated its screen. The dark comedy stars Laura Dern as Ruth Stoops – an unrepentant addict who finds herself and her fetus caught up in the abortion debate. Dern, whose actor father Bruce Dern starred in Payne’s 2013 black and white elegy Nebraska, has remained close friends with the filmmaker. She’s come to Omaha at his invitation. She does a walk-by in Nebraska, which shot near Norfolk, and she has a speaking bit in Downsizing. salesperson in a presentation of luxury houses for a small persons¹ resort community,” Payne confirmed. Having Downsizing play at the Dundee marries a Nebraska landmark with the work of a native son icon. On Downsizing netting ecstatic notices at the Venice International Film Festival and more tempered reviews in Telluride and Toronto, where much of it shot, Payne leaned into the Latin he studied at Creighton Prep. Payne’s cinema stories explore uprootedness. His restless characters undertake physical and metaphoric journeys in search of home. Home is ever more on the Oscar-winner’s own mind. He plans resettling here permanently with wife Maria and daughter Despina Evangeline come next year. “It’s a big fall for me both personally and professionally.